This was the 13th edition of Reeperbahn Festival. We look back at four fantatstic days full of concerts, sessions, showcases, networking events, awards ceremonies, fine art, film, literature and great memories and a lot of inspiration! In numbers this means over the course of four days, over 45.000 visitors came to Hamburg to witness Reeperbahn Festival, 5,500 of them professional guests from 56 nations, more than ever before. We say thank you to everyone participating and helping make Reeperbahn Festival 2018 an amazing event again. Please stay tuned for the upcoming edition and review including a great selection of photos, session retrospectives and interviews that will be published in the next weeks via our E Magazine. Also, feel free to browse our great video footage of concerts to be found in our online media library already. Save the date: The next Reeperbahn Festival will take place on 18 – 21 September, 2019. Early Bird Tickets for Reeperbahn Festival Conference are available for only €133.00 net (plus VAT and sales fee)! Go to ticket shop. We are looking forward to meet you next year! 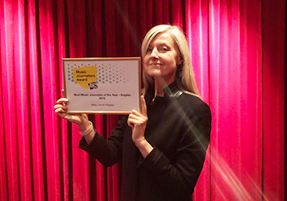 For the second time the International Music Journalism Award have been awarded at this years Reeperbahn Festival (photo: Mary Anne Hobbs – Best Music Journalist of the year – english). The winner of the category The Best Music Business Journalist of the Year has been chosen via online voting during Reeperbahn Festival. More than 400 delegates participated in the voting. We are delighted to announce MusikWoche (German Music Business Magazine) as the winner in the category The Best Music Business Journalist of the Year as a tribute to their services to the music industry in the German-speaking world! 150 outstanding articles, radio shows, podcasts, TV shows, and web links as well as around 80 journalists from all over the world have been recommended to us as worthy of praise. The complete list of winners including the laudatio can be found on our website. The winner of the prize draw (2 tickets for Reeperbahn Festival Conference 2019 plus 4 nights at the Artoctel Onyx, the official festival hotel) will be contacted via mail. 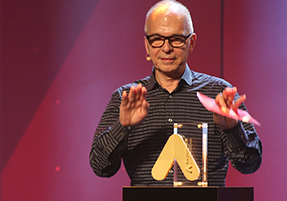 The ANCHOR 2018 - Reeperbahn Festival International Music Award was awarded in a in an extraordinary award ceremony at St. Pauli Theater. This year's jury members Tony Visconti, Linda Perry, Skye Edwards, Cassandra Steen, and Jason Bentley called for more courage to be innovative among emerging artists. After heated discussions, the jury decided to award the ANCHOR 2018 to both Tamino and Faces on TV. Musical highlights of the spectacular ANCHOR 2018 Award Show were the live performances of Metronomy and ANCHOR Judge Linda Perry who performed her signature song "What's Up" together with co-judges Skye Edwards and Cassandra Steen accompanied by the Kaiser Quartet! Since 2016, the ANCHOR Award honors the most promising emerging artist from the festival’s program. Get more info on the ANCHOR here. From October 2018, event partners Reeperbahn Festival, re:publica and next media accelerator will be hosting five events in Los Angeles, New York, Portland, Detroit, and Austin. Over the course of the year, Deutschlandjahr USA will see numerous transatlantic projects, events, and workshops come to life in the US. The Year of German-American Friendship (“Deutschlandjahr USA”) is a comprehensive and collaborative initiative funded by the German Federal Foreign Office, implemented by the Goethe-Institut, and with support from the Federation of German Industries (BDI). Join the SEQUENCER TOUR USA here.